Christian Dils & Manuel Seckel are the developers from Fraunhofer IZM who along with René Vieroth have also recently launched their company Stretchable Circuits making state-of-the-art flexible, stretchable, micro-embedded LED circuits which can be “ironed” into garments, programmed, washed and worn! Their research is exceptional in the field of wearable technologies and is set to change wearables from a niche / science practice to a mainstream technology. They have as well collaborate with fashion designers, university students, and industries eager to experiment with the integration of circuit technology into textiles and are setting the standard for wearable technologies to come. What are your backgrounds? What Universities did you attend and what are your degrees? Christian Dils: I received my degree in Microsystems Technology from the University of Applied Sciences, Berlin, in 2005. For my thesis I worked on a wearable electronics project in collaboration with Infineon, afterwards I went to Seattle for an internship at International Fashion Machines with Maggie Orth. I started working at the Fraunhofer IZM in 2007. Our research efforts are geared entirely to people’s needs: health, security, communication, energy and the environment. You work at Fraunhofer Institute IZM, a research institution which specializes in developing technologies for applied uses. Can you tell us more about the Faunhofer’s general research goals and how is operates? CD: Fraunhofer is Europe’s largest application-oriented research organization with more than 60 institutes and 18,000 employees at different locations in Germany with an annual research budget of 1.6 billion Euros. The Fraunhofer organization undertakes applied research of direct utility to private and public enterprise and of wide benefit to society, as, for example the development of the MP3 technology. Our research efforts are geared entirely to people’s needs: health, security, communication, energy and the environment. The Fraunhofer organization receives funding both from the public sector (approximately 40%) and through contract research earnings (roughly 60%). MS: At the Fraunhofer Institute for Microintegration and Reliability IZM we are working in the field of microelectronics and microsystems with a focus on system integration and interconnection technologies. We also cooperate closely with the Technical University of Berlin (TU Berlin), especially within European joint projects and on basic research into materials for packaging technology. At TexLab we are investigating new approaches to connect electronic components with conductive textiles at room temperature. This includes, for example, embroidering with conductive yarn and crimping isolated textile wires. What kinds of technologies / labs does the Fraunhofer Institute IZM have at its disposition linked to the production of specialized garment-focused technologies? CD: Since 2001 Fraunhofer IZM has contributed to electronics integration into textiles in an ever increasing number of national and international projects. As a result, in 2009 Fraunhofer IZM launched TexLab, where competencies and equipment for the integration of electronics into textiles are concentrated. Besides the many tools for assembly, reliability and analysis at IZM, additional equipment for textile processes and textile reliability tests have been installed. This includes an industrial embroidery machine, a thermo-press, a crimping machine, a washing machine for standardized testing and a tensile tester. At TexLab we are investigating new approaches to connect electronic components with conductive textiles at room temperature. This includes, for example, embroidering with conductive yarn and crimping isolated textile wires. Additionally, fast and cost effective lamination processes are being evaluated to connect components. Adhesive bonding using conductive adhesives and soldering with low temperature solder are also being tested in combination with different textile materials. MS: In the last two to three years IZM has made a big investment into the modernization of labs and equipment. Now we own an ultramodern process line for substrate manufacturing. This, for example, enabled the development of the SCB (stretchable circuit board) technology. How does the access to certain technologies affect the types of material research you conduct? What kinds of research able to do which is specific to the Fraunhofer IZM labs? MS: Fraunhofer IZM’s state-of-the-art equipment for microelectronics permits a further miniaturization of textile-integrated electronics with higher functionality and lower production costs. As an example, we have developed a certain technology, where the electronic components are embedded into the substrate. This space and cost effective technology is now used to manufacture tiny RGB-LED modules with integrated controller unit and bus communication. These so called “Smart Pixels” will be used in the future for our wearable light applications such as with our collaboration with Austrian designer Wolfgang Langeder for “The Utope Project”. 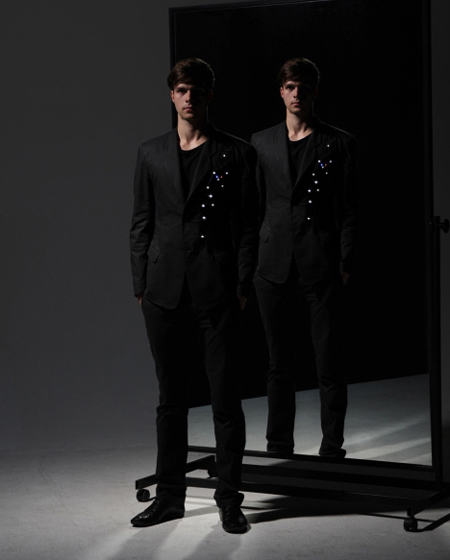 CD: A main research focus is the connection of conductive textiles with electronic components. We do not have weaving or knitting expertise at IZM, so we cooperate a lot with textile institutes, such as the TITV in Greiz, which provides us with conductive textiles, ribbons and substrates. First, wearable electronics products failed in the field due to interconnection and reliability problems between electronics and flexible cables. This problem is still not solved and a bottleneck for the commercial success of smart textiles. The Fraunhofer Institute IZM (according to the website) is specifically concerned with “assembly and packaging technologies for microelectronics, microsystems and power electronics”. How do you see innovation in this field applying to wearables technologies? How does innovation in “microelectronics, microsystems and power electronics” further wearable technologies? CD: First, wearable electronics products failed in the field due to interconnection and reliability problems between electronics and flexible cables. This problem is still not solved and a bottleneck for the commercial success of smart textiles. At IZM we are investigating interconnection technologies for different materials and applications using IZM expertise in assembly and packaging technologies. Apart from that, the encapsulation of electronics is crucial for reliability under harsh conditions, especially washing. So this is why we have developed processes for liquid encapsulation, as well as transfer molding and hot-melt encapsulation. MS: We also believe that the user of a wearable product expects an unobtrusive, reliable, comfortable yet invisible electronic system. Therefore, the miniaturization of the electronics is another important step towards market success. As the materials and processes are cheap and already in use we also believe there will be mass market production in the next coming years. The Fraunhofer was involved in STELLA: STretchable ELectronics for Large Area Applications, can you tell us what kinds of developments happened as part of this research which affected wearable technologies? MS: Because of financial advantages we were involved in STELLA by way of TU Berlin and not through Fraunhofer IZM. In the STELLA-project we developed the basics of the SCB technology. In the beginning we tested many different materials and processes until we received promising results. Now, we already have successfully transferred the technology to a local PCB manufacturer. This was made possible by using already existing machines and conventional flexible PCB fabrication processes. As a result, we are expecting the SCB technology to be available for industry very soon. As the materials and processes are cheap and already in use we also believe there will be mass market production in the next coming years. CD: The SCB uses a thermoplastic elastomeric foil as base material as already used in the textile industry for adhesive bonding. So in the last year of STELLA we were experimenting with laminating the SCB onto different kinds of textile materials like denim, cotton, silk and leather and we always received very good results. 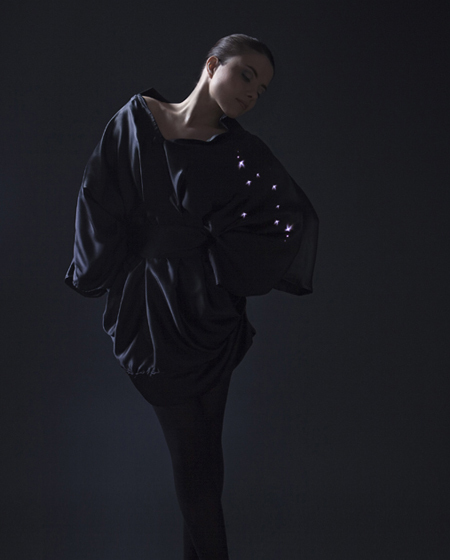 Thus, we started an initial project with fashion design student Mareike Michel wherein we developed our wearable technology platform and the interactive dress “Klight”. The future of lighting will be the LED: the chips are already available in huge quantities at low costs with ever increasing efficiency. “PLACE-it stands for ‘Platform for Large Area Conformable Electronics by InTegration, and aims to realize an industry platform for thin, lightweight and flexible optoelectronics systems. These will not only open new dimensions in product design, but will also create unique opportunities for on-body applications in healthcare and wellness. CD: In my opinion, light is a very general and essential medium. It can be used for communication, security or therapeutic applications or as a design element. The future of lighting will be the LED: the chips are already available in huge quantities at low costs with ever increasing efficiency. We are developing in the PLACE-IT-project new concepts and technologies for the integration of LEDs and OLEDs into flexible and textile materials for future products. MS: In a European joint project the application is determined by the end users, the industry. Research institutes such as Fraunhofer are working on specific technical solutions which in the best case can be used for many different applications. I guess that in the PLACE-IT project one of the main drivers for lighting applications was the demand from the industry. How does an institution such Fraunhofer IZM collaborate with corporations such as Philips? Is Fraunhofer IZM involved in projects such as LUMALIVE. How does the knowledge transfer take place from a research institution such as yours to a corporate one? Do you train the Philips personnel to make things based on your research or do you make things to order for them, or conduct consultation sessions? MS: Until now, we haven’t been involved in the LUMALIVE project. Some guys from LUMALIVE are also part of the PLACE-IT project, so there will be collaborative project work in the next years. If the project results will be used for new products is not in our hands. CD: We have different models of how companies can work with us. First, we can conduct direct research for a company or apply for a public-funded joint project. Second, companies can get training or attend a workshop from us. Also, companies can license technologies which have been developed at Fraunhofer. I believe engineers and designers benefits from each other — a so called win-win situation. MS: Imagine? Not really in the beginning of my work as an engineer! Now, after some successful collaborations, I can image working more often with designers. I guess some colleagues still see us as the “artsy” division, but most of them have already realized that our work may also have an impact on their lives in the future. For example, I’m thinking about the use of our technologies in medical and safety applications. CD: From the beginning I liked the interdisciplinary of the field. I believe engineers and designers benefits from each other — a so called win-win situation. Without a good design and application / concept our technologies will always stay in the darkest corner of our lab and for designers it is very stimulating to use new technologies and materials. Without a good design and application / concept our technologies will always stay in the darkest corner of our lab and for designers it is very stimulating to use new technologies and materials. You collaborated with Zane Berzina and her students at the Berlin University of the Arts (UdK) to produce Theresa Lusser’s “dis.appear” project. How did that work? Did you teach the students how to make the technology or did they come to the Fraunhofer Institute IZM and experiment? CD: We met Zane in 2007 at the Avantex conference where she asked us for general interest in participating in a student project that she was planning at the UdK Berlin. Then, in 2008 we co-organized a one-week workshop for the students where we trained them to develop and realize simple circuits by using conductive yarns. In the following semester the “E-motion” project was started by Zane, fashion design professor Valeska Schmidt-Thomsen and her team. Our job was more or less to coach the students, therefore providing information about materials and technologies for the integration of electronics into textiles. In the end, it turned out that we were helping with direct technical work such as making electronics and programing code. It was much fun and we were very impressed by the innovative concepts as well as the students’ commitment to the project. MS: That’s why we continued to work with the students from UdK. In 2010 we collaborated with product design student Stephanie Hornig and jointly developed the flexible lighting concept “Canvas”. Both students, Theresa and Stephanie, had a clear idea about their concepts, which we liked a lot, and therefore we realized them using our facilities. Another good example of a joint design project is Pneuma with Synne Frydenberg, which was also realized in the “E-motion” project. Unfortunately, at the moment we are too busy with our own company to continue to work with design students but our colleague Philipp Foerster took over and so he is now working with Zane and her students at the Weissensee Kunsthochschule Berlin, school of art, in the new e-textile laboratory. We (on the artistic creative side of things) often think that technology has everything to teach us, however did working with student / artist / designers make you rethink some of the technology? MS: We are receiving a lot of feedback and wish lists from our customers, mostly designers, which are partly pushing us into new developments as for example the previous mentioned “Smart Pixel”. 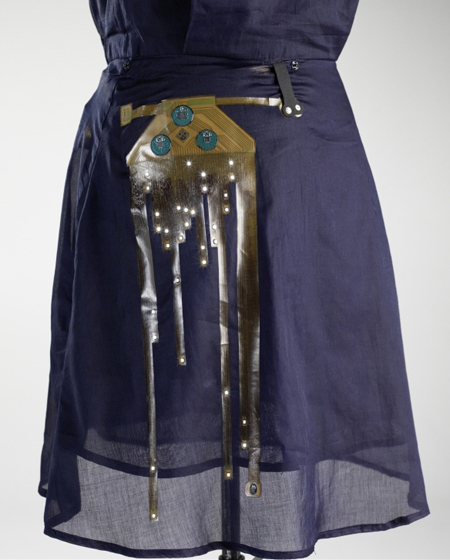 CD: We thought the SCBs would be used to hide unobtrusively the technology inside the clothing. However, we discovered that many designers like the shape of the stretchable conductors and therefore want to use the SCB on the fabric outside as a design element / art piece. So, we changed the color of our base materials and now offer different surface metallization such as silver and gold to our customers. In sum, we have to agree that the SCB looks very cool now. The goal of our company is to provide engineering services and project management for flexible and stretchable electronic systems for all kinds of applications. You launched your company Stretchable Circuits, is it with the specific goal of making this technology more accessible to designers, or did you simply see a niche market that was not being addressed? How did the idea of the company come about? MS: The idea was on my mind for a long time. Only after the success of our first collaborative design projects — the interactive dress “Klight” and the “E-motion” project, which gained a lot of interest in media and industry — did we decide to start our own company Stretchable Circuits. CD: The goal of our company is to provide engineering services and project management for flexible and stretchable electronic systems for all kinds of applications. In the beginning, we focused on fashion design but we are getting more and more request for other applications such as medical sensors and interior design. In fact, the company was started in order to give designers access to the technology because at Fraunhofer IZM we are more focusing on technical applications such as robotics, consumer electronics and automotive. Can you describe in simple technical terms what is innovative about “stretchable circuits’? How long has it taken to develop, from research to production? CD: The SCB technology is an industrial solution for the integration of electronics into textiles with outstanding mechanical characteristics. The SCBs are 3D conformable, crumpable, soft, lightweight, and biocompatible and can be easily integrated into textiles by lamination. Additionally, the material can be wet cleaned. MS: It took us 5 years from research to production. Now we are concentrating both on bringing the first products onto the market with our company Stretchable Circuits as well as further developing the technology in several projects at Fraunhofer IZM and TU Berlin. We want to break down barriers for non-technically trained designers by offering both a single step in the product development and the whole development over prototyping to small volume production. CD: The company members own expertise is in the fields of project management, material science, technology development, electronics (design and conception), interconnection and packaging technologies as well as medical and textile electronics. We want to break down barriers for non-technically trained designers by offering both a single step in the product development and the whole development over prototyping to small volume production. Through our own expertise, network of specialists and our access to the latest production technologies and equipment, we offer a unique opportunity to implement our customer’s ideas into reality. MS: After several years in the field we have a good understanding what designers are looking for when it comes to the technical realization as well as what works and what not. That’s why we can guide our clients from idea to product. What are the differences, based on your experience, of working with the healthcare vs. the fashion industry? MS: Some basic differences are that it takes more manpower and time to develop, evaluate and bring a medical product into the market. Also, you have to be aware of a long and expensive process to certify the product within the national and international standards for medical devices. Otherwise, there is a lot more money to be earned in the healthcare as opposed to fashion industry. Other applications which will be available soon after are conformable keypads (either haptic or capacitive), sensor structures for example for seat occupation detection or artificial skins for robotics, or just simple stretchable conductor wires for different technical applications. CD: This and the next year there will be still a focus on lighting applications. Other applications which will be available soon after are conformable keypads (either haptic or capacitive), sensor structures for example for seat occupation detection or artificial skins for robotics, or just simple stretchable conductor wires for different technical applications. As mentioned before, we are open to all kind of applications. 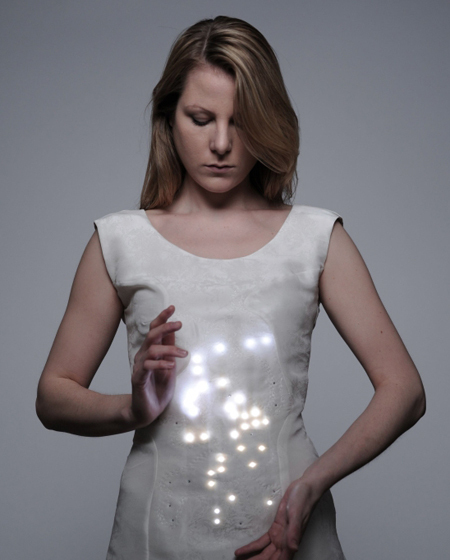 With Stretchable Circuits you collaborated with some young up and coming designers such as the local design label MOON Berlin & Austrian fashion designer Wolfgang Langeder. How did this come about and what was the collaboration process? CD: We met Wolfgang at Ars Electronica in 2009 and since then we have established a close partnership with him. He was the first designer we met with a broad experience from the fashion industry and many new ideas for bringing smart fashion into the market. From the beginning we discussed very openly with Wolfgang about his visions for fashion and how to translate them into real products. The first results of our collaboration will be exclusively available in some well-known design stores in 2012, so check out our newsfeed from the Stretchable Circuit website to be the first to get the limited and ubercool pieces. What kind of industries do you anticipate working with Stretchable Circuits? Fashion? Architecture? Space? CD: I guess next to the fashion industry we will work with interior and product design as well with the automotive industry. MS: I think, we will also work more with the healthcare industry and last but not least architecture is a very interesting field too. I don’t believe that the fashion industry will take on the costs of investing for these technical / electronic innovations. 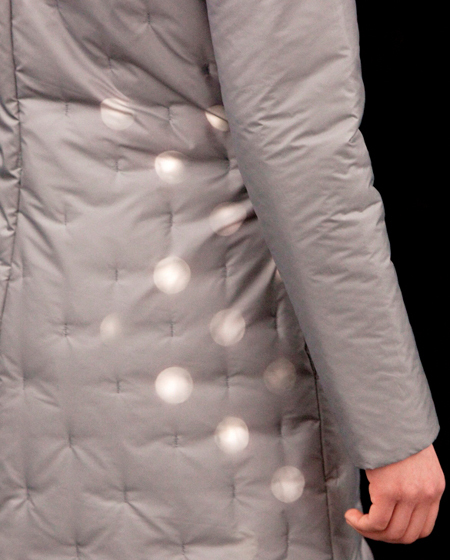 Why are we not seeing this technology in mainstream textiles / fashion? 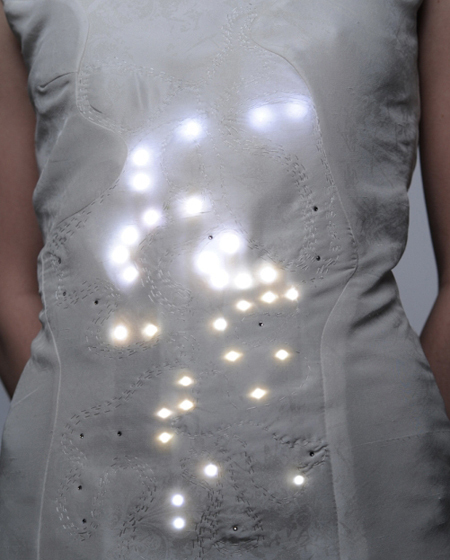 Why can’t I buy a dress with LED-embedded stretchable circuits from H&M? CD: Because the technology is still not cheap enough for mass market clothing. It takes huge investments, time, and manpower, as well as a new supply chains, regulations about recycling and product warranty for that. I don’t believe that the fashion industry will take on the costs of investing for these technical / electronic innovations. I think that we will first see mass-market product in very different applications such as in the automotive industry and design before it adapts to low-cost fashion products. So I expect our technology will still only be available in niche products like those currently developed and launched in interactive events and stage wear in collaboration with design specialist Novanex.